I received my Master’s Degree from The Juilliard School studying under the tutelage of legendary clarinetist and recording artist Charles Neidich. Teaching was always my passion and I opened my own private studio as soon as I graduated from the Juilliard School in 2007. In my everyday teaching I strive to present my knowledge in the most accessible way possible while maintaining the highest professional standard. I have been maintaining a private clarinet and saxophone teaching studio for the last 12 years. As a touring soloist I get invited to present master classes, most recently at Tyler Junior College and Austin Peay State University. My students are continuously ranked at the top in competitions, ABRSM exams, many successfully passed auditions for All-State, All-County and a variety of youth orchestras. Most of all, I am happy to see that they continue to play the instrument and make music part of their lives in college even though some are not music majors. In addition to my career as a teaching artist, I have been touring extensively as a clarinet soloist and with various chamber music ensembles in the U.S. and Europe. In 2007, as a winner of the Artists International Competition in New York, I gave my New York Debut recital at the Carnegie Hall. Since 2012 I have been performing as a co-founding member of the Shtrykov-Tanaka Duo with internationally renowned Japanese pianist Misuzu Tanaka giving more than 100 concerts across the country; currently we are one of the most active clarinet-piano duos in North America. In 2018 we joined our forces with Hungarian cellist Anita Balázs and founded Trio Confero. In the past several seasons I have appeared with the Amadeus Festival Orchestra as a soloist Mozart’s Clarinet Concerto as part of Festival Amadeus (MT) and on many eminent concert series across the country including Fairmont Chamber Music Society (WV), Black Hills Chamber Music Society (SD), Chamber Music Society of Maryland, Ridgecrest Chamber Music Society (CA), Cedarhurst Chamber Music (IL), the Ross Ragland Classical Series (OR), RIT Performing Artist Series (Rochester, NY), the Dame Myra Hess Memorial Concerts (IL), Summer Stars Classical Series (NJ), Tuesday's Music Live Series in Augusta (GA), Frederick Collection Historical Piano Concerts (MA), and Endless Mountain Festival (NY) to name a few. My recent orchestral engagements included principal clarinetist of the New York Festival Orchestra under the direction of maestro Hideaki Hirai with performances at the Carnegie Hall/Stern Auditorium and Merkin Concert Hall. In addition to my main instrument, I am proficient in saxophone and piano both as a performer and a teacher. Being able to accompany lessons at the piano for all of my students has become an essential part of my teaching method since I believe that it is important to develop ensemble skills during the early stages of learning an instrument. I strongly believe that with my educational background, extensive professional experience as a teaching artist, soloist and orchestra performer I will be able to help students to achieve their goals and move forward to the new performing horizons. No reviews yet. 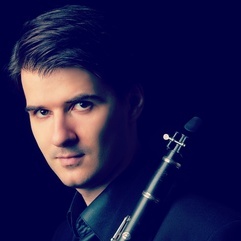 We offer a money back guarantee if you are not happy with your lesson, so why not try a lesson with Maksim? Take live online video lessons with professional, passionate Clarinet or Saxophone teachers from around the world. All you need is a computer equipped with a webcam and microphone. Learn more about how it works.